When the initial meeting of John and Charlie occurred is now hidden in the fuzzy shroud of the past. Both grew up in Sweden about 55 miles away from each other. Both spent their early American years in Minnesota. Both traveled west to north-central Idaho. They could have met at any point in these “close encounters.” We do know, however, the business partnership began sometime around 1914. 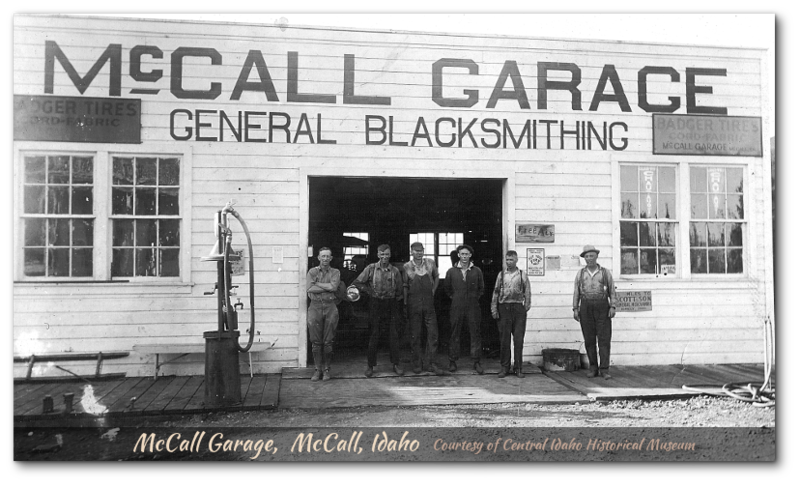 During this time, Charlie found himself in McCall, Idaho buying into the blacksmith shop of John N. Peterson. The fledgling firm called “Peterson & Carlborg” is first seen in written documentation in 1915 (The Crowbar advertisement described below). 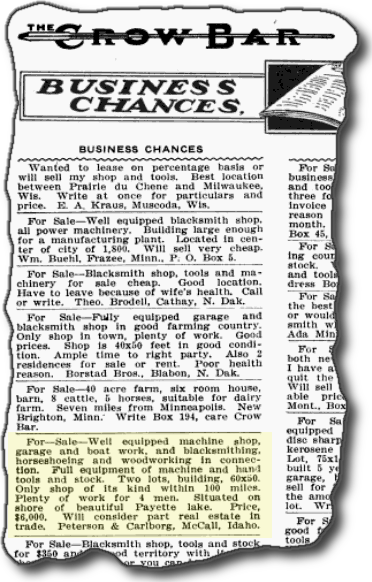 Peterson & Carlborg’s blacksmith shop/garage was shore-front property located on McCall Avenue near Lake Street. One development occurred about this time that radically changed John and Charlie’s lives, as well as nearly everyone else on the planet. Ford Motor Company began selling an automobile called the Model T in October of 1908. Henry Ford’s stated purpose was to “build a car for the great multitude….But it will be so low in price that no man making a good salary will be unable to own one – and enjoy with his family the blessing of hours of pleasure in God’s great open spaces.” Ford delivered on that promise. 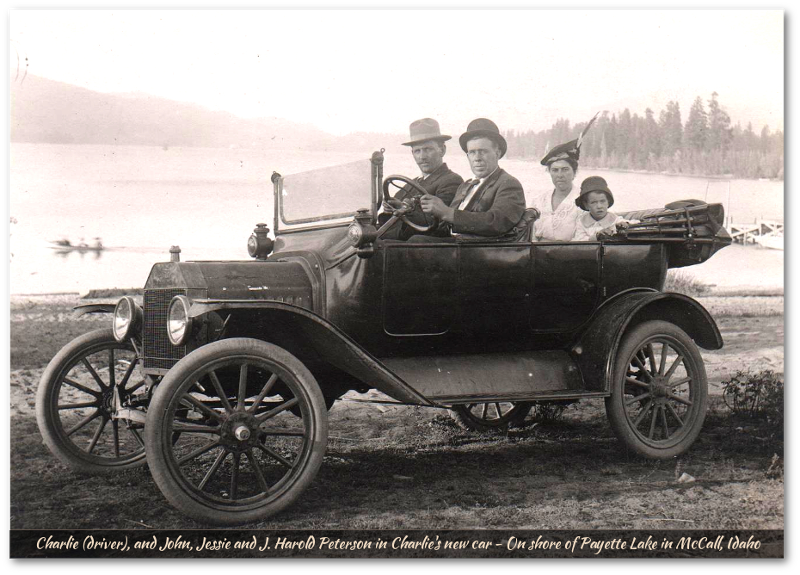 By 1915, with John and Charlie in business together, over 1.25 million Model T’s were on the road. A few scant years before, a blacksmith spent his time shoeing horses, fixing buggies and other horse drawn wagons, as well as general iron manufacturing. Now the blacksmith was working into the role of mechanic for horseless carriages like the Model T. This role continued to grow until, at one point, John and Charlie could claim they owned a “garage business”. John and Charlie, with a business location on the shore of a popular recreational lake, also added boat repair to the menu. With the advent of the Model T, John and Charlie saw another business opportunity. The following is an excerpt from a printed family memoir written by John’s niece, Ione. The “Ben” described in the account was John’s brother-in-law, Ben Johnson. During the Idaho years of Peterson & Carlborg, John and Charlie traveled to Boise regularly. Boise was the largest nearby city, the commerce hub for the smaller towns scattered around. Events during the early 1900’s created rapid growth for Boise. A large part of that boom was Arrowrock Dam. Constructed for the purpose of supplying irrigation water for farmers in the Boise Valley, work began in 1910 and completed in 1915. For nine years following its construction, it was the tallest concrete arch dam in the world. The benefits of Arrowrock Dam to the surrounding economy consisted of several layers. Not only did the dam’s completion provide valuable water to farmers in the region but about 1400 people worked on the project, stimulating the local economy. These factors can certainly be seen in the population totals for Boise. From 5,957 people in 1900 to 17,358 people in 1910, an increase of 191%. By 1920 the population was 21,393. After the rail line was completed in 1914, travel to Boise for John and Charlie was easy. Charlie sent a postcard to his sister Hulda in 1919 stating he was currently in Boise (Postcard was of Arrowrock Dam). On one of these trips to Boise, according to John Derville, Jr., John and Charlie met Edward A. Boyd. Boyd became a significant player later in the early development of P&C. Indeed an “E.A. Boyd” is listed in the 1918 Boise City Directory. Boyd was living at the Hotel Bristol and his occupation was “V-Pres Idaho Electrical Supply Co. Ltd.” E.A. Boyd is last seen in Boise in the 1923 Directory with an interesting notation, “moved to Los Angeles Ca.” Boyd later earned the nickname, “The Spearman” for his propensity for starting new businesses and leaving sometime after they became established. John and Charlie began an ambitious plan – a plan involving tool production on a manufacturing, factory level. They listed their McCall business for sale and began considering where to build a factory. In May of 1918, the “firm of Peterson & Carlborg” sold the garage property to John’s brother in law Ben Johnson for $2,500. In January of 1919, Johnson sold the property back to Peterson & Carlborg. These hiccups may have been frustrating for the aspiring tool manufacturers, but they continue to make plans to move. In mid-November, 1919, Charlie sent a postcard to his sister Hulda, alluded to earlier. In the postcard Charlie writes, “…my partner and I are thinking about going to Klamath Falls, Ore.” In January of 1920, Peterson & Carlborg sold two residential lots in McCall. Charlie, John and family are noted in the 1920 census in McCall, but there is no record of them residing in Idaho thereafter . Idaho was the incubator. 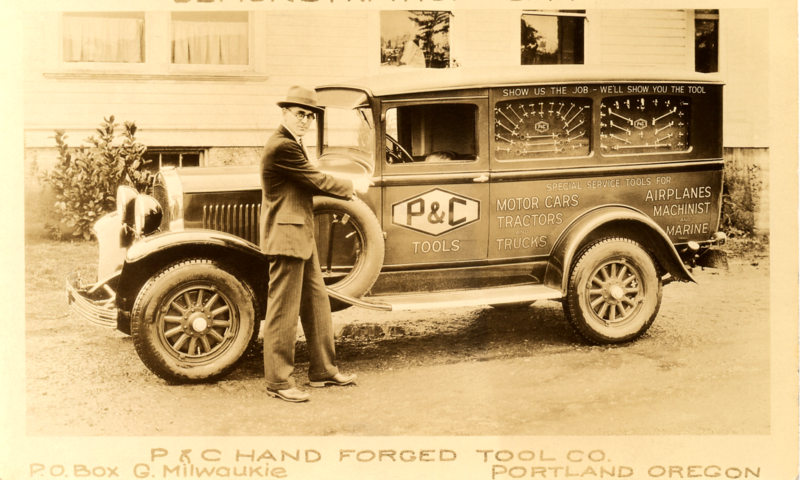 Contrary to previously published accounts, the firm of Peterson & Carlborg began making tools in McCall, Idaho around 1914. Oregon was irresistible, however, with a greater population base, much milder weather, closer access to raw materials that might be arriving by ship, seaport and/or rail and a ready market for hand tools. With the dream of a tool manufacturing factory fixed in their minds, they left Idaho for Oregon.